You heard right, ladies and gentlemen. The reigning Prince Of Darkness is finally stepping down from the throne – for real this time – but not without an ENORMOUS farewell tour!! 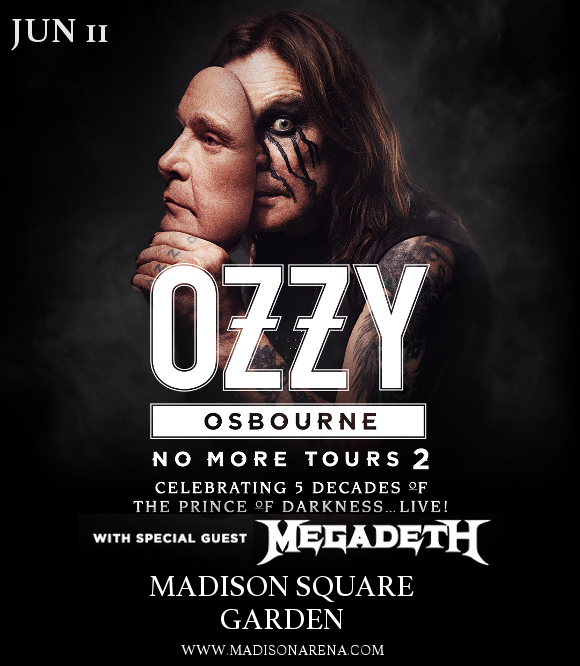 The Madison Square Garden is proud to host Ozzy Osbourne, touring with Megadeth and special support acts to be announces, on Tuesday 11th June 2019!! If you’re a true Ozzy fan, then you can’t not be there to pay your tributes to one of metal’s greatest for the very last time. Tickets available NOW and expected to VANISH – so don’t miss out!! Grab yours right this second!! Originally rising to fame as the vocalist of Black Sabbath, Ozzy Osbourne is largely credited as being one of the founding fathers of heavy metal as a genre, with his distinctive, piercing voice and wild onstage antics. Following his departure from Black Sabbath, he went on to establish a successful solo career with the help of his wife and manager Sharon Osbourne. Between Black Sabbath and his solo career, Ozzy Osbourne has sold over 100 million records, making him one of the best- selling artists in recent musical history. Beginning his farewell tour in 2018, a hand infection brought a halt to Ozzy’s tour, but indestructible as ever, the metal legend is back on his feet to greet fans in 2019 instead.